I am so excited about an upcoming collaboration that I'm doing to celebrate fall fashion. I can't reveal too much (I know, lame), but I simply couldn't resist a little sneak peek today! 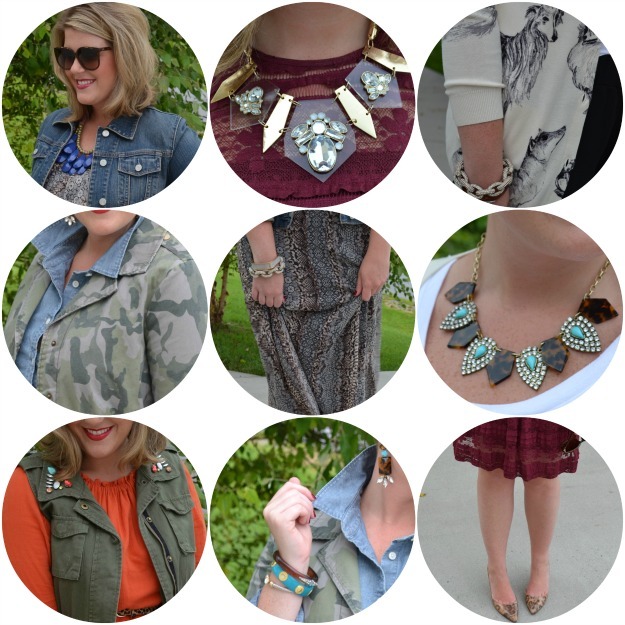 I styled five looks featuring some of my favorite colors, prints, and details for fall - jewel tones, tortoise shell, camo, lace, chambray and more! I can't wait until the feature is live so you can see the full looks! Until then, who's ready for cooler temperatures?! Can't wait to see more! That tortoise and turquoise necklace is gorgeous! Now this looks and sounds incredibly exciting! Judging by the pictures, it's going to be something fabulous and inspiring. I can't wait! We spy some pretty camo pieces!! Yay!